One fun and interesting aspect of blogging is the ability to check your stats to see which are the most popular posts. One of my most visited and shared posts is Books for Sad and Scary Times written in the aftermath of the Boston Marathon Bombing; in fact, I was gratified to find out that a prominent center for children and family treatment had distributed copies to their therapists. One of my goals as a blogger is to offer my readers useful information and clearly (though unfortunately), adults are finding themselves called upon to help the children in their lives process and sort out their feelings surrounding various painful events. Given their lack of life experience and knowledge, children left alone to deal with their emotions and impressions can often be confused and frightened and draw faulty conclusions, sometimes to their everlasting burden. The loving adults around them must offer age-appropriate explanations and comfort and remain truthful, while reframing things in a more positive way. Isn’t this what we all want? Helping parents and other caregivers find a way to address a sensitive topic was uppermost in my mind when I wrote GG and Mamela. Inspired by my family’s experience when my lovely mother became ill and entered hospice care, I decided to tackle this subject after finding no other children’s book that did. I am proud to say that Kirkus Reviews proclaimed GG and Mamela “a welcome addition to children’s literature about death and dying.” Other accolades have followed, including “outstanding in all criteria…a lovely story…well-written and very touching. The illustrations are outstanding, with well-formed expressive figures that stand out well from the nicely-detailed backgrounds.” –Judge, Writer’s Digest 22nd Annual Book Awards. GG and Mamela also landed a top spot on The Gittle List 2014. Most recently, GG and Mamela won a gold medal in the 2014 Wishing Shelf Book Award competition. What distinguishes the judging in this case is that children, along with their teachers, assess and vote on their favorite books. 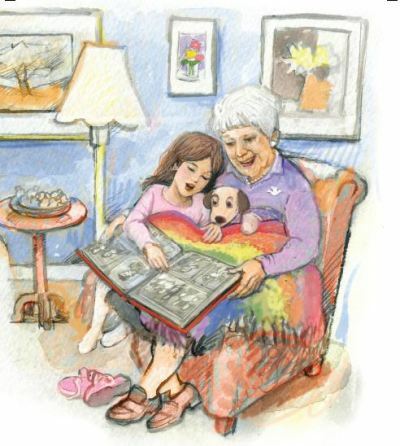 GG and Mamela appeals to children because even though it does deal with a sad issue, it is not a sad book; actually, it celebrates the warm, strong relationship between Lily (Mamela) and her great-grandmother (GG) and focuses on the joy that GG derives until the end of her life. The themes of love, family and tradition as well as the story’s emphasis on the value of inter-generational relationships will work with any belief system. GG and Mamela’s underlying message that love never dies will resonate with both adults and children. I was fortunate to partner on this project with the talented, experienced and award-winning illustrator/artist/political cartoonist Avi Katz, whose beautiful water-color illustrations complement the text perfectly. GG and Mamela concludes with GG’s recipe for chicken soup (a blogger/reviewer made this soup with her young daughter and documented the process) and an afterword by clinical psychologist Dr. Laura Brock. If you, or someone you know, would benefit from a gentle and open-ended way to start a conversation about loss with a child, GG and Mamela would be an excellent choice. In addition, you can feel good about your purchase, as a portion of the proceeds will be donated to a hospice care organization. Wonderful post Belinda. Hospice and death are such difficult for adults, much less for children. I found your book incredibly helpful in helping my grandchildren try and cope better in a very sad time in our family’s lives. Congratulations on making it the finals – I hope your book wins- it deserves to! Thanks, Barbara, for your kind comments and good wishes. It means a lot to me that your family found my book helpful. Glad to see you back and congratulations on all the praise you’ve received for your book! It sounds wonderful! So great to know that writers can help others who are going through the same difficult times by sharing their experiences via their books. Thanks, Lauri; I really appreciate your support. Yes, it feels good to write about it and even better when you find out that you’ve helped someone else.